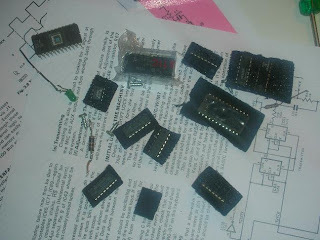 Taking a look at the UK101 board and the various chips (ICs) is very interesting. The dominant brand is Synertek. The MOS 6502 uP was 2nd sourced by Synertek. All the ROMS are Synertek as well, also 4K of memory. Even more interesting are the date-stamps. Most chips are dated late 1979, for example the Synertek 6502 dated at 1979 week 41. Some others are from early -80. The extra 4 K memory chips are dated 8049 which surprised me as I thought I did this upgrade in first half of 1980 and not in -81?. The oldest chips on the board are the Texas 74LS163's from 1973 w39! 36 years old, still doing a simple but important job! The MOS 6502 could actually be considered as an early "pipelined RISC" processor and was clearly faster than the popular Motorola 6800, Zilog Z80 and Intel 8080 uP's at the time. Even at less clock speed. And this to the price of some 15% of the competition, introduced at 25 USD per chip! MOS was soon taken over by CBM (Commodore) already around 1976-77 to supply CBM's productlines with 65xx uP's (PET, VIC what-ever). This takeover was, in my opinion, a sad story as many developers soon one by one left CBM including "the man" and 6502 chief designer himself, Chuck Peddle.